If you have set up a Global Admin specifically for CiraSync, there is one more step to select a specific Office 365 public folder. 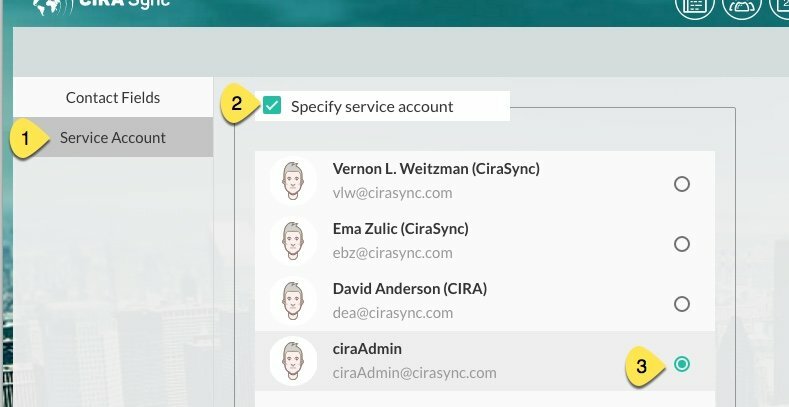 When any of your Global Administrators logs on the CiraSync dashboard, their Azure access token is used as the default for contact sync tasks. This can be a huge problem if that user has global admin status, but does not have rights to the Application Impersonation role. Important: You can’t set up the new CiraSyncAdmin account until you logon at least one time. When you logon, CiraSync is granted a token from Azure AD. Without the token, CiraSyncAdmin wont appear in the list of available service accounts. From this point forward, you no longer need to log on as CiraSyncAdmin account. Each IT staff member can access the dashboard under their own Office 365 identity. IMPORTANT: If you sync public folders to Outlook contacts or calendars, be certain that the CiraSyncAdmin account has reviewer permissions on that Office 365 public folder.